The Trump administration has been sharing sensitive nuclear technology and energy information with the Saudis — an issue that's gained increased scrutiny since the Oct. 2 murder of journalist Jamal Kashoggi by a Saudi hit team at the consulate in Istanbul. American lawmakers now want to get to bottom of it, and a group of senators have notified Energy Secretary Rick Perry to demand answers over how and why he allowed multiple US firms to provide Riyadh with potential nuclear secrets and information sharing typically only available to Washington's closest western allies. The Senators are also seeking answers regarding the kingdom's possible development of atomic weapons and the degree to which they've received any level of assistance from the United States. Starting a week ago various media reports revealed that Perry had authorized so-called Part 810 approvals, which gave US companies authorization to share otherwise closely guarded nuclear information with Riyadh. Alarmingly, according to Reuters, the "approvals were kept from the public and from Congress." The approval had been reportedly given first in November 2017, which facilitated the transfer of “unclassified civil nuclear technology”. It appears the Energy Department's defense will hinge on the necessity of leaving such information sharing programs private in order not to reveal “proprietary business information.” The department has further emphasized “no enrichment or reprocessing technology” was shared with Saudi Arabia. 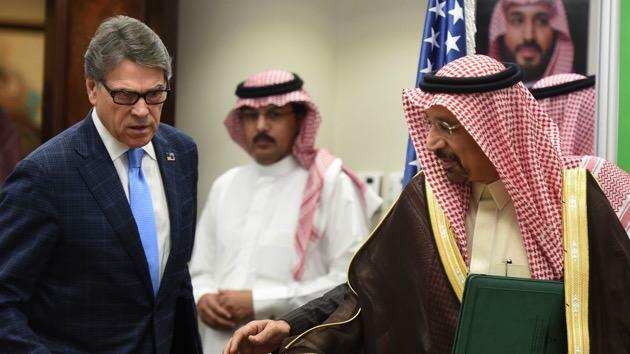 Perry has also recently testified before Congress that countries like Saudi Arabia will go elsewhere, relying on unsavory actors like Russia and China, for help with nuclear energy if the US shuts the door on them. However, in their letter Senate leaders have given Perry until April 10 to provide answers and details over just what information was shared. Senators Bob Menendez and Marco Rubio wrote that the Saudis have engaged in “many deeply troubling actions and statements that have provoked alarm in Congress,” according to the letter seen by Reuters. The letter further said that the lack of what's called a 123 agreement with the kingdom prevents the Nuclear Regulatory Commission to license the export of nuclear material, equipment and components. Thus information sharing must meet with congressional approval, stated the letter. “We are particularly concerned about this mechanism being used right now with Saudi Arabia,” the Senators wrote. They also voiced fears that Saudi Arabia could be pursuing a banned nuclear weapons program. The letter said further, “Many in Congress, therefore, worry that Saudi Arabia's interest in someday producing its own stocks of nuclear fuel – despite the fact the Kingdom could purchase fuel on the international market more cheaply – could lead to it to divert fuel to a covert nuclear weapons program,” according to Reuters and Washington Post reports. Interestingly, President Trump's son-in-law and adviser Jared Kushner may have been directly involved in secret dealings with the Saudis related to nuclear power, recent reports suggest. The Senators concluded that ultimately, "We... believe the United States should not be providing nuclear technology or information to them at this time."